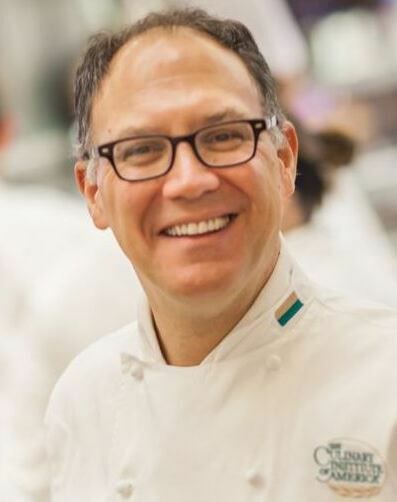 William ‘Bill’ Briwa, chef, teacher, puppeteer, singer, husband and father, died in the Queen of the Valley Medical Center in Napa, CA on July 28, 2018 at the age of 60 due to complications from Scleroderma. Graduating from The Culinary Institute of America (CIA), Hyde Park NY in 1980, Bill immediately packed up his belongings and moved to Napa Valley to find out for himself what California cuisine was all about. He thought what he found was grand and adopted the valley as home. In his early Napa Valley days, Bill worked in restaurant and winery kitchens around the valley where he made many life-long friends. In 1981, he partnered with Elizabeth Stephens to take over Palmer’s Café on Main Street in St. Helena. Palmer’s customers provided Bill with a group of avid cyclists to ride with and when Palmers was sold in 1987, he set off on a solo cross-country cycling trip. On his return, he took a hiatus from cooking to become a puppeteer with the Magical Moonshine Theater. Before becoming a chef, Bill studied theater at Bard College in New York. A natural performer, Bill loved music and had a beautiful tenor voice. A beloved teacher and chef at The Culinary Institute of America at Greystone for 23 years, his love for music made its way into the kitchens where he was known to break into song. Born November 1, 1957 in Rochester, NY to Charles and Rhoda Briwa and raised in the Hudson Valley, NY and Germany. He is survived by; his wife, Holly Dierkhising Briwa; his daughter, Carmen Elizabeth Briwa; and his brother, Charles Briwa III of Albany, NY. He is preceded in death by his parents, Charles Briwa Jr. and Rhoda Retz Briwa, and brother John Briwa. The family would like to thank the caregivers at the Queen of the Valley Medical Center for the kind and professional care Bill received during his illness. A celebration of Bill’s life will take place at The Culinary Institute of America at Greystone, St. Helena in the teaching kitchen on Saturday, September 22, 2018 from 3-5pm.